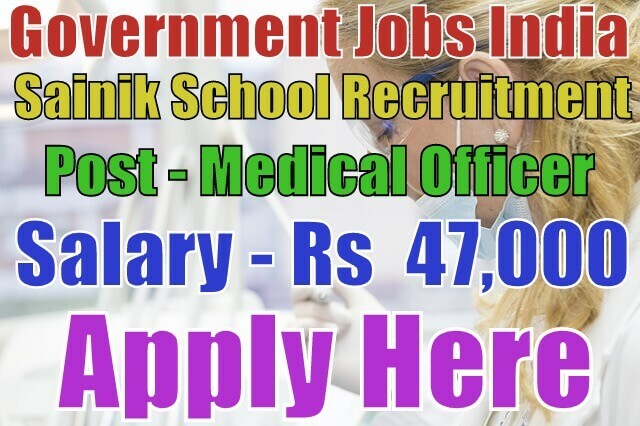 Sainik School Balchadi, Jamnagar has published recruitment notification 2017 for 05 school medical officer, lower division clerk and ward boy posts. All legible and interested candidates have to apply on or before (24-03-2017). Further more information about salary details, application fees, educational qualifications and all other details / information about these posts is mentioned in detailed below. 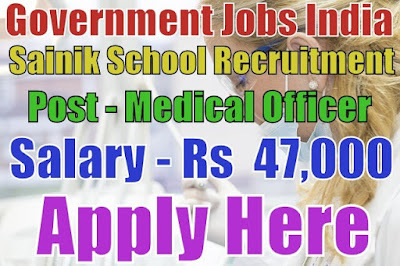 Salary / Pay and Grade pay - For medical officer post, the payable salary will be Rs 47,000, for lower division clerk post, the payable salary will be Rs 5,200 - 20,200 with Rs 1,900 grade pay and for ward boy post, the payable salary will be Rs 15,000. Age Limit - For sainik school recruitment, candidate age should be 18 - 50 years. To know more information about age details as post wise, go to detailed advertisement mentioned in last. Educational Qualification Details - Candidate must have done matriculation,12th, graduation degree, MBBS degree or it's equivalent / relevant / higher qualification from a recognized board or university. Candidates must have some experience in their fields. To know more about qualification details per post, click on detailed advertisement. Selection Method - For sainik school vacancies, candidates will be selected on the basis of their performance in written test, practical and then interview. Candidates should be prepared for these tests. Application Process - All legible and interested candidates have to download application form from official website www.ssbalachadi.org or from given detailed advertisement. After downloading and filling the application form, candidates need to send application form with relevant / needed testimonials(which are completely mentioned in detailed advertisement) super scribes "Application for the post of ' Name of Post' " to the given desired address. Application Fee - The application fee will be Rs 30/- only.